or your grandmother who just doesn’t see you enough … we bet you could find the perfect use for a free photo book from Google Photos, courtesy of Google Fiber. While supplies last, in-store visitors to our local Fiber Spaces in Nashville, Kansas City (Westport location only), Austin, Provo, Salt Lake City, Atlanta, Charlotte and Raleigh-Durham will be able to come in and create a free photo book from Google Photos* on us. Click on your city for information on your local space, like hours and directions. So start choosing between your fiercest food shots, selfies, baby pics, fur baby photos. . . or whatever else makes your (or someone on your list’s) heart sing, to make your own 20 page soft bound photo book. Don’t worry, our Specialists will be there to walk you through the process. Supplies are limited, so get ‘em while they’re hot! **No purchase necessary. Void where prohibited. Promotion begins 11/15/2017 and continues while supplies last. Open to legal 18+ residents of the contiguous United States. Must be redeemed in-store. Promotion is valid for (1) 7-inch square, 20 page soft bound book per person including shipping and taxes. Must download Google Photos app to create free book. Posted by Vivian Tsai, Head of National Retail Strategy Operations. Maybe it’s a replacement for that old coffee table book you’ve had forever or perhaps a gift for your cross-country best friend who you miss terribly or your grandmother who just doesn’t see you enough … we bet you could find the perfect use for a free photo book from Google Photos, courtesy of Google Fiber. in two initial areas of our deployment near Westover Hills and in the West End Park neighborhood. There’s more - and even better - news: in San Antonio, we’ve priced our Fiber 1000 (1,000 mbps) service at $55 per month. There’s no installation fee, no hidden fees, no contracts, and no data caps. Just super fast Internet service for less than the speed limit on I-35. As we announced last month, our focus in San Antonio (as in Louisville, where we launched service earlier this month) is on providing super fast Internet service, enabling folks to access content - including live and local TV content - from any source they choose. The abundant bandwidth and low latency of a Fiber connection makes streaming video, even in 4K, 3D, or virtual reality formats, smooth as butter. We know that San Antonio, home to Hulu’s recently announced 500-person customer service operation, loves video streaming. So one option when you sign up for Fiber is to add YouTube TV. YouTube TV offers cable-free live TV from San Antonio’s local stations -- ABC, CBS, FOX, NBC -- and other popular cable networks like ESPN and AMC, along with a cloud DVR with no storage space limits. Customers who sign up for YouTube TV at the same time they sign up for Google Fiber will also receive a NVIDIA® SHIELD™ TV, the most advanced streaming device and a voice-activated remote control powered by Google Assistant, and a free trial of YouTube TV. After the free trial, you can keep YouTube TV for $35 per month. 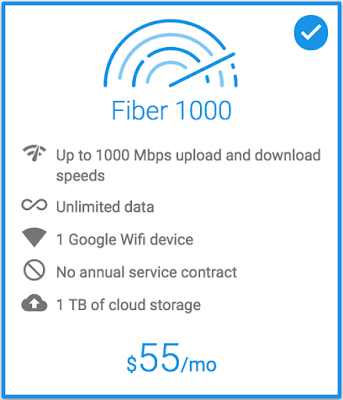 Most people access their Fiber connection using wifi, so we’ve included with your sign-up one free Google Wifi router. (Additional devices are available for purchase during installation if the size or shape of your home requires it for full coverage.) And Google Wifi includes top-tier security and smart technology that lets you prioritize devices, block certain websites, and stay on top of kids’ screen time. We want to thank San Antonio leaders for their vision and leadership throughout the process of bringing Fiber to the Alamo City. We also want to thank San Antonians for their patience - building a brand new fiber network is a big infrastructure project and a massive undertaking, and you’ve stuck with us. San Antonians in these first neighborhoods are open until Dec. 21. Meantime, we’re continuing to extend the network to more of the city, so if you’re not in an open area just yet, be sure to leave us your email address so we can notify you when your address is eligible. 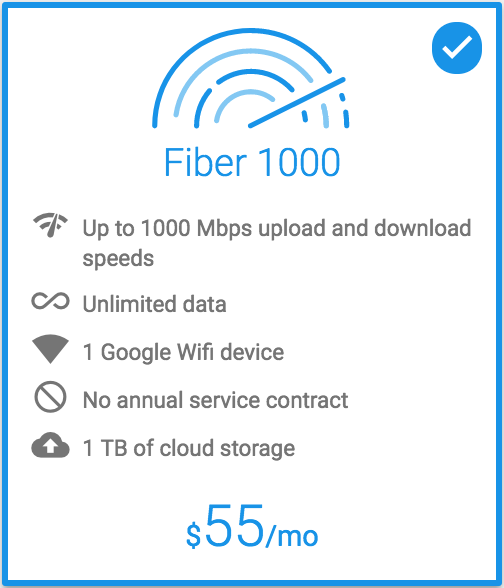 Alamo City, Google Fiber has arrived! We’re excited to announce that today, we launched sign-ups in two initial areas of our deployment near Westover Hills and in the West End Park neighborhood. Orange County is pretty famous. We’ve got a lot going on -- Disneyland (the original), world-renowned beaches (these ones, and this one), and we’ve also got some super fast Internet happening. Google Fiber launched last summer, and we’ve been growing steadily in the area ever since -- enjoying just how original the OC can be. In true Orange County fashion, we celebrate our milestones. Last night, hundreds of residents of The Village at Irvine Spectrum joined us for a Google Fiber Festival, complete with food, music, fun and games. Our partner, Irvine Company, is a leader in innovation for their residents, and recognized early the value of building for the technologies of the future. Not many companies would have had the foresight in the mid-1980s to install empty conduit in their properties, but that thinking allowed Irvine Company to future-proof its buildings and adapt to advances in technology quickly. They have been key in our efforts to expand high-speed broadband service in Southern California. Irvine Company understands that connectivity matters, and we’re excited to help their residents connect faster and more efficiently. And they are doing a lot with that connection -- from monitoring the latest surf conditions to more critical tasks at hand. One gentleman told us at a recent OC event that Fiber’s high speeds and low latency would allow him to keep tabs on his father’s welfare, through a webcam, when they can’t be together. In fact, we recognize that Internet access can truly change a life -- that’s why we’ve also been working to make connections with Orange County-area organizations that share our goals of expanding STEM and computer science education opportunities to local kids. Through partnerships with the Girl Scouts, Irvine Public Schools Foundation and others, we’re excited to continue building those relationships to benefit the entire community, and enhance the efforts and capacity of these local nonprofits. Orange County, we’re just getting started! You’ve already got a great reputation, but we hope that one day when people say OC, they’ll think about all the things that can be via fast Internet -- even if it’s just streaming the latest episode of every TV show set here simultaneously. applications for next year’s program are now open, due on November 27, 2017. “Wait, what exactly is it you do again?” was a frequent question I was asked by my new co-workers during my first weeks as a Digital Inclusion Fellow at Charlotte Mecklenburg Housing Partnership (CMHP). CMHP is a broad-based, private, nonprofit housing development and financial corporation organized to expand affordable and well-maintained housing within stable neighborhoods for low and moderate-income families in the City of Charlotte and Mecklenburg County. We have dedicated staff who work with people to buy their first home, avoid foreclosure, and move in to affordable housing. A new digital inclusion program at CMHP would be a unique animal, and I figured it would be an exciting challenge to find ways to weave digital inclusion throughout seemingly unrelated existing programs. As it turns out, digital inclusion seamlessly intersects with many, many factors necessary for a high quality of life and opportunity in our communities -- including housing. As a Fellow, I was able to work with staff to integrate aspects of digital literacy into their work with clients. Whether it be how to search online for affordable housing options, manage a bank account online, or check your credit score before applying for a mortgage. Along the way we also discovered how digital literacy classes can serve as a forum for building a sense of community between neighbors. As a Fellow, I worked with a variety of partners to highlight the connection between Internet access and daily life in areas such as health, education, and financial literacy. I created digital literacy curricula and tailored classes to meet the unique needs of the students in the room. This allowed our program participants to work toward their own definition of success. One student was able to learn how to use Facebook to connect with long-lost family members in Somalia. Another participant was just as thrilled to learn how to watch her pastor preach during the live streaming church service. During a “health + digital literacy” class, one student left satisfied when she learned how to share a photo of herself 50 lbs. slimmer. These varying pictures of success were what made being a Fellow such a meaningful experience. I was privileged to both teach and learn from hundreds of students (and volunteers! ), and to be there to cheer them on when they reached their personal goals. Upon completion of the Fellowship year, all questions about how digital inclusion could possibly make sense in our nonprofit housing organization have disappeared. I am fortunate to now be a permanent full-time employee at CMHP as the Community Engagement Specialist, where digital inclusion remains one of my key priorities. Recently, I was able to go back and visit past Computer Basics 101 students. These were residents at Cheshire Chase, one of CMHP’s affordable housing communities where Google Fiber is providing free gigabit internet to all residents and E2D provided each class participant a refurbished laptop. The coalescence of high speed Internet access, devices, and digital literacy training all in one place helped residents make the most of their educational and professional opportunities.. What a difference a year makes -- you can hear firsthand from residents what this program meant to them and their families in this video. If you are a staff member at an organization interested in helping your community bridge the digital divide, now is your time! NTEN is currently accepting applications for 2018 Digital Inclusion Fellows, funded by Google Fiber and other companies, in cities across the country through November 27, 2017. Apply today! Posted by Cache Owens, former Digital Inclusion Fellow and current Community Engagement Specialist, Charlotte Mecklenburg Housing Partnership, Inc. The Google Fiber blog is excited to feature a guest blog from a former NTEN Digital Inclusion Fellow -- DEADLINE EXTENDED: applications for next year’s program are now open, due on November 27, 2017.